If you're new to the aquarium hobby it's hard to think of any fish which could make a better choice for you than danios. Small, hardy, easy to care for, attractive to look at and always active, they're great pets, and they're not even very expensive. Fond of the upper levels of the aquarium which most other fish avoid, they fit in easily in community tanks and can make a superb addition to your aquarium. Playful and highly sociable, danios are naturally happy in the aquarium environment, but they'll be at their happiest if you can supply them with strong currents, plants, and other items which give them things to do. Make sure they have plenty of space to move around. They enjoy darting about and chasing each other, though never aggressively. Omnivorous by nature, they will eat almost any food, but you should make sure they get plenty of vegetable matter (in the form of flakes or algae discs) in order to be healthy, and they enjoy live food for treats. Zebra -With striking horizontal stripes, these active little fish make a handsome addition to any aquarium. They prefer relatively cool water and plenty of light. Pearl - These beautiful iridescent fish are highly adaptable but do need plenty of oxygen, so make sure your aquarium has good filtration. Leopard -These hardly little fish have a black spotted pattern all over their bodies. They sometimes interbreed with zebra danios. 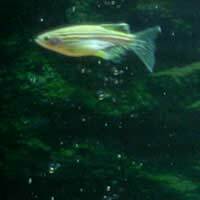 Gold - Highly active and fond of playing near the surface, these fish have golden-orange stripes running the length of their bodies. They are sometimes (incorrectly) called albinos. Blue -These fish have a mottled blue and white appearance and are believed to be descended from leopard danios. Giant -Twice the size of other danios, these fish are happiest in large shoals, so they need a lot of space. They are also quite shy, so they won't give you as much to watch. Recently, a new kind of danio has appeared on the market - the glo-lite danio. This fish is a product of genetic engineering and contains anemone genes which make it glow under UV light. Its sale is illegal in some places, but research so far suggests that the fish themselves are fairly healthy and behave normally. It's worth noting, however, that they are difficult to breed successfully. Danios enjoy living in large groups but you should always keep them in odd numbers in order to avoid antagonism over pair dynamics. If you keep more than one species of danio together, make sure you have at least three of each kind. One of the reasons why danios are so popular is that they're easy to breed - in fact, it can be hard to stop them breeding! If they are happy with their surroundings, the average pair will spawn about once a week, starting as soon as there's light in the morning. However, they have no parenting instincts and will happily eat their own eggs and fry, so if you want to preserve the young you'll have to use a spawning tank or quickly remove eggs from the main tank. You can do this gently using a pipette or a straw. Approximately two hundred eggs will be laid at each spawning. Males and females are fairly easy to distinguish, with the females being larger and rounder. Danios are great fun and many aquarists who get a few as an experiment end up falling in love with them. Lively, resilient and charming as they are, they come very close to being the perfect aquarium fish. @Liz. Usually it's the other way around and Danios, especially those of the pearl and zebra varieties, are prone to being eaten by other fish. However, they too can be a little violent and aggressive and like to chase, especially if they have a small school. Usually this doesn't harm unless one of your fish might not be on top form health wise, in which case your danios might kill and/or consume. One option might be to remove them from the tank into another for a week or so, then introduce them back, so a new pecking order has been established. However, if you feel uneasy about having them in the tank, it's probably not advisable to 'flush' and would be much kinder to find them a new home. Your fish are not deliberately being mean - all fish are natural predators and are doing what comes instinctively to them. On a more general note - to avoid your fish eating each other, it is best to ensure fish of a similar size are kept together. Hope this helps.